Sanya tourism market has welcomed back overseas tourists as it is recovering from a slump since 2008 and has become a favorite destination for Russian tourists looking to escape winter, reports sanya.hinews.cn. 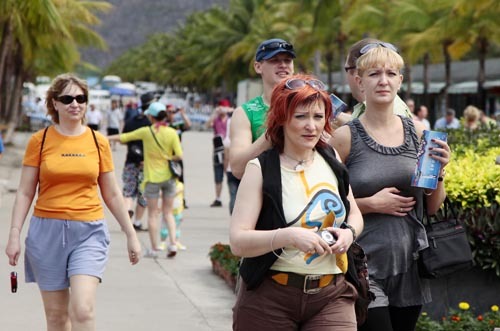 Russia is one of the most important feeder markets for Sanya’s tourism industry, and the number of Russian tourists is expected to hit record high this year. This year, Russia, Kazakhstan and other countries have strengthened cooperation and promotion with Sanya toursim market, according to Mr Tang Sixian, deputy director of Sanya Tourism Bureau. Among them, the number of Russian tourists are expected to exceed 140,000 in 2010. According to statistics, in 2007, the number of inbound tourists to Sanya reached 500,000 for the first time, and the number of Russian tourists hit 147,000. However, Sanya tourism market experienced slump due to the global financial crisis in 2008. The inbound visitors declined by nearly 40% in 2009.